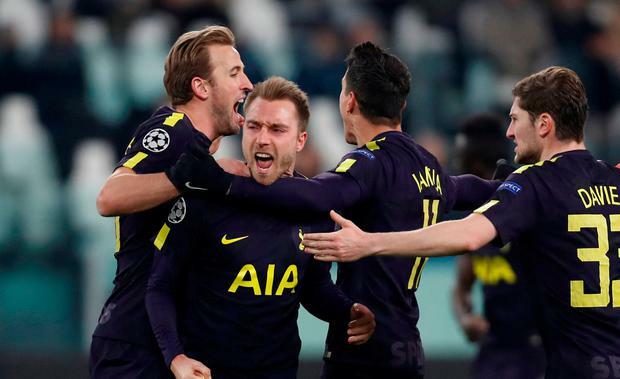 Christian Eriksen admits the old Tottenham would have crumbled after falling two goals behind to Juventus and believes their comeback demonstrates their progress under Mauricio Pochettino. Spurs have a place in the Champions League quarter-finals within reach after they snatched a 2-2 draw and a pair of precious away goals from the first leg in Turin on Tuesday. The outlook was bleak when Gonzalo Higuain scored twice for Juve in the first nine minutes but Tottenham dug in, with Harry Kane and an Eriksen free-kick salvaging what felt like a victory at the final whistle. When Pochettino first arrived in 2014, he took over a team that had regularly been thrashed by the big sides, their mental fragility exposed whenever the pressure mounted. But Eriksen, who was at his sparkling best at the Allianz Stadium, believes those days are now long gone. "Of course we are building on every season compared to when I arrived here four or five years ago now," Eriksen said. "The games against the top teams when you are 2-0 down after nine minutes you lose 6-0. That's the thing we've changed with the manager coming in, with the players we have here. "Everyone has grown up and they are not going to lie down if they are 2-0 down anyway. "Tottenham, compared to what it was when I came to what it is now, is completely different. That's up to the manager, up to the players and the quality we have in the squad really." Pochettino's reputation continues to grow, particularly given Tottenham had already beaten Real Madrid and Borussia Dortmund in this year's competition. Eriksen insists the players are not worried about the future of their manager. "No, the players are happy with him, the club is very happy with him," Eriksen said. "Of course, it's his decision but I think what's he's building here he would like to be part of it. I think that's what he showed when he signed the new deal, a long-term deal. "Of course there will be interest from other clubs because he's doing really well but hopefully he'll stay. We don't really think about that." Spurs will face an altogether different challenge on Saturday, when they take on Rochdale in the FA Cup and a muddy pitch that caused the League One club's fixture against Fleetwood last weekend to be postponed. Pochettino has not hidden his dismay at the surface, which is being relaid this week, but his side cannot afford to be distracted. They are under pressure to end Tottenham's 10-year drought without a trophy. "I don't know if you ever feel ready to win a trophy, most clubs are just used to it," Eriksen said. "Tottenham are not used to it but of course we are going to give everything we can to get as close as possible to get our hands on a trophy. To get close is the first step."